Departs daily at 6:30 PM year round, additional departure added during peak season. This live narrated 90 minute tour of San Francisco shows you the most vibrant neighborhoods of the city! 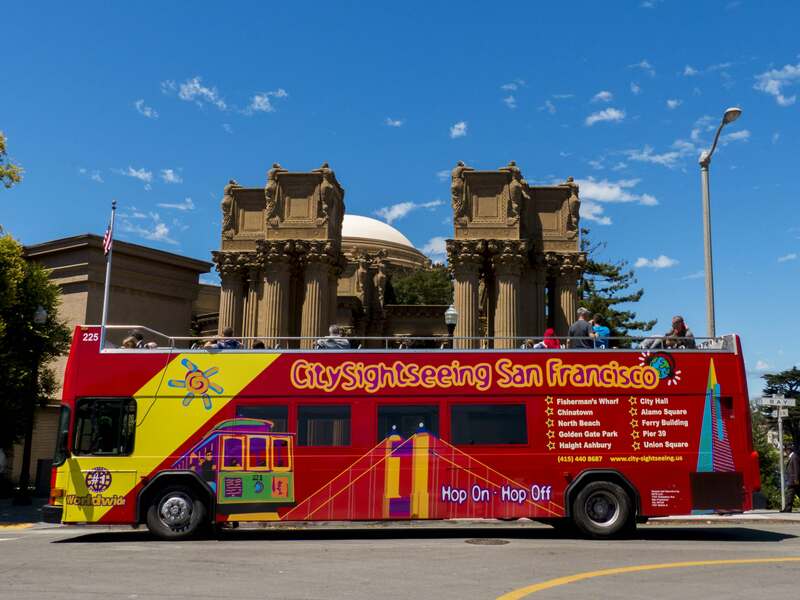 With spectacular views from the top of an original open top Double Decker bus, the tour covers all major sites of San Francisco. The tour starts from Fisherman’s Wharf, it would take you through Marina District to Palace of Fine Arts for a photo stop. The tour will continue through Nob Hill - well known for the best views of San Francisco and with its impressive Grace Cathedral. Through Financial District your bus will take you across Bay Bridge with its a spectacular art installation of lights that have become San Francisco’s iconic light sculpture to Treasure Island - a little island between San Francisco and Oakland with the best views on San Francisco skyline. 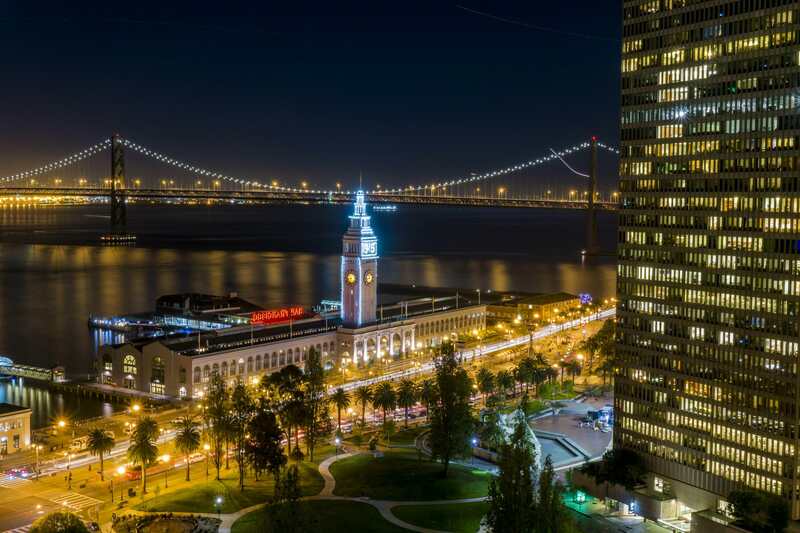 On your way back you will also see Union Square, Chinatown and North Beach, known as Italian district and famous Fisherman’s Wharf and Pier 39. 4. Bay Bridge - Bay Bridge Light sculpture. Departs from 10 AM to 5 PM every 30 minutes. Daily. Year Round. Length: 1 hour. Enjoy the Sausalito Tour by crossing the Golden Gate Bridge, one of the world’s most famous landmarks, in an open top bus with great views of the bridge, and explore the charming coastal town of Sausalito. Take this tour from South Vista Point to have the best views of the Golden Gate Bridge while driving across the 1.7 mile span of the bridge to get to North Vista Point. From there you have breathtaking views of the San Francisco Bay (weather permitting), and on a nice day you can see the San Francisco skyline, Alcatraz Island and the Bay Bridge, making it a great photo stop for every visitor. The tour then carries on into Marin County and stops in charming Sausalito where you can hop off the bus, stroll around, shop, dine, visit various art galleries and enjoy a relaxing lunch by the waterfront. You also have the opportunity to catch the next bus from Sausalito to Muir Woods (must have ticket for Muir Woods Tour) or take a scenic ferry ride back to San Francisco (tickets available at ferry terminal, next to bus stop). 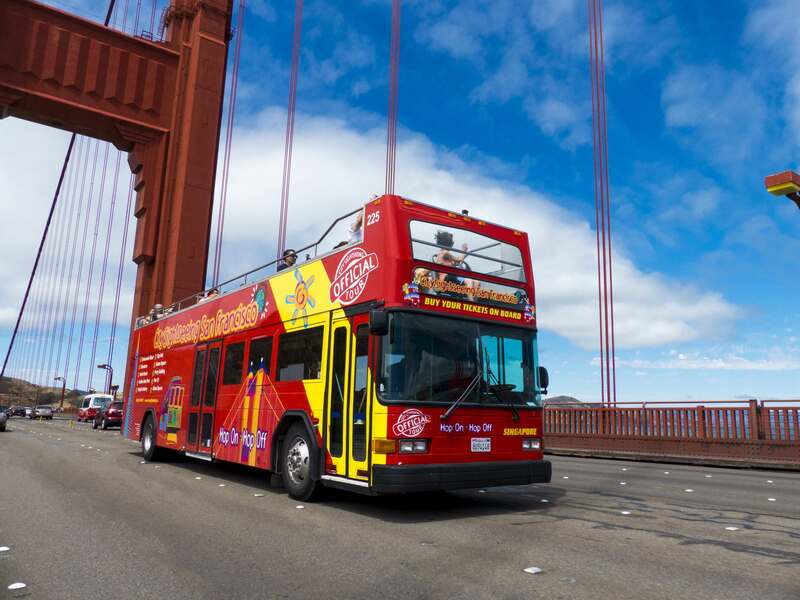 From Sausalito, the bus will head back across the Golden Gate Bridge to South Vista Point where you can either join the Official City Tour (must have appropriate ticket) or explore the area. You can visit the Golden Gate Bridge Welcome Centre, stroll around the Presidio, or relax at the beach at Crissy Field. The tour departs from Fisherman’s Wharf, taking you along the Embarcadero, Barbary Coast, the Ferry Building, Financial District, and right into San Francisco’s central shopping area at Union Square, before heading to the iconic Golden Gate Bridge. 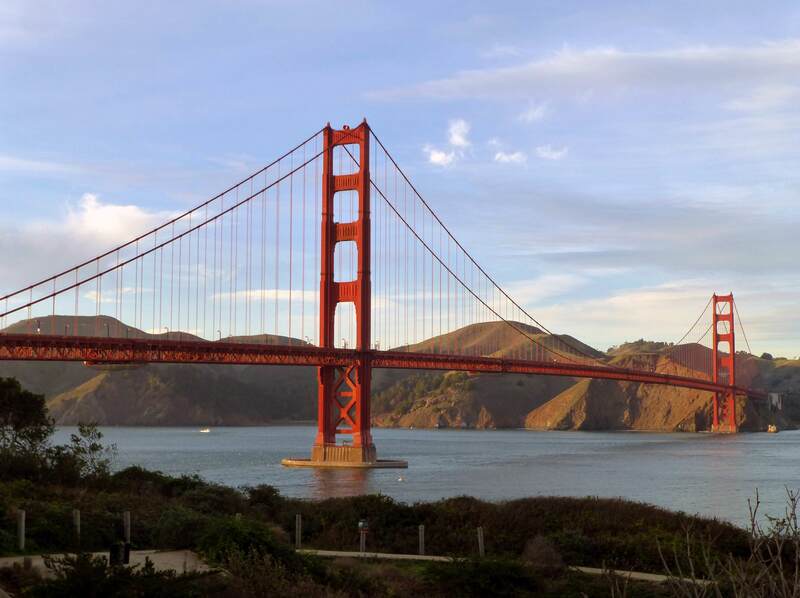 At South Vista Point you can walk across the 1.7 mile span of the bridge, or you can explore the Golden Gate Bridge Welcome Center and the Presidio. The tour continues into Golden Gate Park, one of the world’s largest man-made havens and one of the most popular places to see in San Francisco. With several stops throughout the park, you can visit the California Academy of Sciences, the De Young Museum, the Japanese Tea Garden, or the Botanical Gardens. Continuing the tour through Haight Ashbury, you will experience the so called “Hippie District”, before we head into the Civic Center area with many architectural landmarks, such as our impressive City Hall, the Opera House, Symphony Hall, the Asian Museum of Art and the public library. Passing Union Square, the tour continues into Chinatown and North Beach with its world-famous crooked Lombard Street, before returning to Fisherman’s Wharf, stopping at various waterfront locations, including Pier 39 where you can see the popular sea lions and explore the restaurants, shopping and many attractions for more fun in San Francisco. Take this tour from South Vista Point to have the best views of the Golden Gate Bridge from an open top bus while driving across the bridge to North Vista Point. From there you have breathtaking views of the San Francisco Bay (weather permitting), and on a nice day you can see the San Francisco skyline, Alcatraz Island and the Bay Bridge, making it a great photo stop for every visitor. 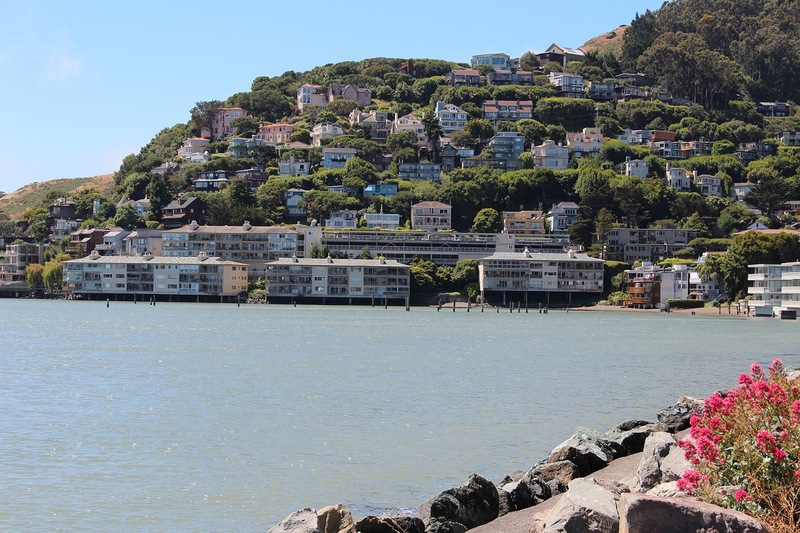 The tour continues into Marin County and stops in charming Sausalito where you can hop off the bus, stroll around, shop, dine, visit various art galleries and enjoy a relaxing lunch by the waterfront. With this 2.5 hour city tour you get the best views of San Francisco's Downtown, the Golden Gate Bridge, and Golden Gate Park from the top of an open top Double Decker Bus. Be sure to bring your camera as there will be plenty of photo opportunities along the way, and simply enjoy the commentary from our entertaining tour guides or with audio guide in various languages while seeing all major sites of San Francisco! Build your own San Francisco experience and SAVE BIG! This valuable San Francisco MEGA PASS includes 3, 4, or 5 options from over 25 popular Tours and Activities in and around town. The pass is valid for 7 consecutive days! Choose any of the world famous Hop-On Hop-Off Tours to see all major sites of the city, such as the Golden Gate Bridge, Golden Gate Park and Downtown San Francisco during the Official City Tour. Explore Ocean Beach right at the Pacific and see the San Francisco Zoo during the Parks & Beach Tour, or cross the Golden Gate Bridge on a ride to charming Sausalito. Hop on and hop off at any of the stops along the routes and enjoy live narration by entertaining tour guides with unlimited ticket use for 24 hours. Play with the Sevengill Sharks at the Aquarium of the Bay and see the city’s skyline from the water during a fascinating Bay Cruise or during a thrilling ride on the Rocket Boat. Take a bike to explore Golden Gate Park or ride a storytelling GoCar along the Marina. Visit the impressive California Academy of Sciences with its own rainforest, aquarium, planetarium, and national history museum. Discover the life of Mickey Mouse’s creator at the Walt Disney Family Museum, meet Barack Obama and E.T. at Madame Tussauds, or learn about modern art at the SFMOMA. Take a ferry to Angel Island and Sausalito with great views of Alcatraz Island and the Golden Gate Bridge. Visit Muir Woods with some of the tallest Redwood trees in the world, or choose from many other tours and attractions, making your San Francisco visit the most exciting and fun experience ever!